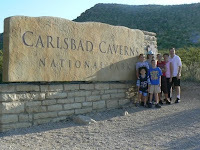 We got up early (5:00am) this morning so we could eat breakfast (6:00am - hot breakfast at Holiday Inn Express) and leave for Carlsbad Caverns by 7:00am. Well, the kids did so well, we left 20 minutes early and got to the park early. That gave us time to take some extra photos including some at the opening sign, some wild deer we saw on the cavern road, and some scenery around the National Park center. We were the 2nd family to arrive at the center but had to wait for it to open (about 15 minutes). 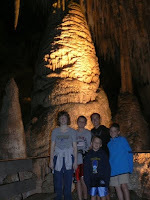 We had bought an annual national park pass (highly recommend it if you are going to multiple parks) and so we just waited in line to get our tickets, then watched a movie about the caverns and at 8:30am started our walk into the caverns. There are two self-guided routes you can take: the natural entrance and the big room route. We were told the first takes 1 hour and the second takes 1.5 hours but if you are not pressed for time, you could do both. Well, we were looking to leave around 11:00am so we thought we might have the time. We started down the natural entrance after a brief orientation from the park ranger. We nicknamed Jariah, "Guano", after the report and he thinks it's funny but then when doesn't a 10-year old boy think poop is funny? The wonder of the entrance is how people years ago ever really got into or out of the cave safely. We finished this route in about 40 minutes - way to go Team Kroll. 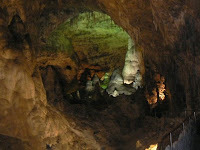 We then launched out into the Big Room route and finished it in 40 minutes - taking our time to see and enjoy the cavern and take a bunch of pictures. I think since we were in the first couple into the cavern and there was no one really in front of us, we could move at our own pace. After leaving the cavern, we spent a little time in the gift shop, and a little money, before heading out to our next hotel in Benson, AZ (a trip of 452 miles). 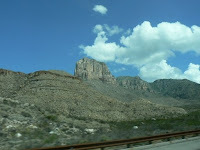 On the way, we drove around and through the Guadalupe Mountain National Forest - not planned but what a blessing! We then ended up passing back into Texas (the kids thought we were done with Texas having driven over 700 miles in Texas), through El Paso, back into New Mexico and then into Arizona. Our Bible Hour was Matthew 23-28 and our in-car movies of the day were the Mummy 3 and The Two Towers. We got to our hotel early and ate (first time for Lisa and kids, first time in 35 years for Tim) at a Jack in the Box right next to our hotel. Kids are swimming before bed. We head out tomorrow for Tombstone and then Las Vegas. Pray for Dave and Cindy Bintz as they travel to Spain today. We thank God for Bob Rajewski (he sold us our great van which is doing spectacular on this trip)!